DVD 1. L.A. Street Life: Vol. 1, Dead Homiez: An up close and gritty examination of the perils of life in South Central (Watts), Los Angeles, California. This action-drama follows the life of a 17-year old member of the Bloods gang and his family and friends’ constant struggle to survive the violence riddled streets of South Central. This movie includes documentary interview footage of real Crips and Bloods gang members. Also includes: A Tribute to Two of America’s Real Gangstaz:Tupac Shakur ,1971-1996 and Christopher Wallace 1972-1997 a.k.a. Makaveli & The Notorious B.I.G. Not Rated! DVD 2. Pimps Up, Ho’s Down:The Director’s Cut- PROSTITUTION DOCUMENTARY- It is the culmination of over a decade of research and production on the shocking and real world of pimps and whores (ho’s). 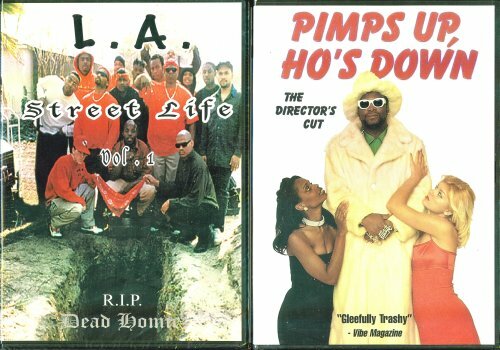 Acclaimed as the definitive Pimp Documentary it has proven too hot for cable TV. With over 30 minutes of unseen footage. Director Brent Owens invites you into the secret society of PIMPS & HO’S to experience the ultimate exploration of the Pimp Game and to meet some of it’s players! Bonus: Trailer, Biographies.